The ideal breeding conditions for the iconic Australian grayling fish in the Thomson River were put to the test in 2015–16. While we know that Australian grayling are more likely to breed when there is more flow in a river, it's important to test the actual volume and rate of environmental water that should be delivered to get the best breeding results. In 2015–16, the West Gippsland Catchment Management Authority (CMA), in conjunction with fish researchers from the Arthur Rylah Institute, tested whether the Australian grayling would breed with a lower magnitude of environmental water than has been delivered to the river previously. "The results indicated that very little breeding had occurred with this lower volume of water", said the CMA's David Stork. "This is an important finding. We now know that to get a good breeding event, we need to aim for the higher magnitude of environmental water." Annual fish surveys in 2015–16 highlighted an improvement in the health of native fish in the Thomson River as a result of environmental watering. The surveys, conducted as part of the Victorian environmental flows monitoring and assessment program show improvements (such as an increasing population) of Australian grayling in particular. "Australian grayling are highly dependent on flows in the river, and our environmental watering is therefore targeted towards their breeding, migration and survival", David said. Landholders along the Thomson River also expressed appreciation after environmental water partially filled billabongs on their properties in 2015–16, providing important habitat for waterbirds, frogs and platypus. 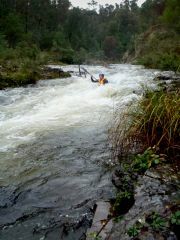 Keen kayakers, canoers and rafters also took advantage of increased flows in the Thomson River created by the environmental watering, which attracted visitors to the area.